Bexar County birth and death records from 1968 to the present are housed at the San Antonio Health Department. The Bexar County Clerk holds records for births 1838-1967, deaths 1903-1067, and marriages from 1837 to the present. Marriage records from 5/1/1959 to 12/30/2011 are searchable on line with free registration. Divorce records are found at the office of the Bexar County District Clerk. On December 22, 1836, the Republic of Texas created the county government of Bexar. 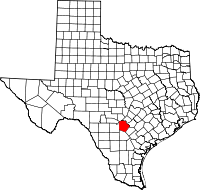 In the 1860s, after Texas was admitted to the United States, the state partitioned Bexar County into 128 counties, including present-day Bexar County.